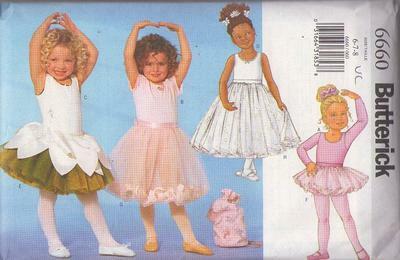 2000 Children, Retro Dance Clothing Patterns - CHILDREN'S/GIRLS' LEOTARD, SKIRT, BAG & PONYTAIL HOLDER Close-fitting leotard, has stitched hems. A: long sleeves. B: short sleeves, purchased rosebud. C: purchased flexible trim. C,D: sleeveless. D: purchased ribbon bow. Slightly flared or flared skirt has three or five-layered dirndl skirt, back slit and purchased ribbon (for waistband/attached ties). E: contrast petals. G: below mid-knee, purchased flowers to place inside of triple-layered skirt. H: below mid-calf. Self-lined bag has purchased cord. Ponytail holder has elastic.